Traineeships are becoming increasingly common for young people during or after their studies, as they can help them to gain relevant experience and find a foothold in the labour market. A Eurobarometer survey on traineeships 1 in 2013 showed that almost every second young person in the age group 18-35 had at least one traineeship experience. 7 out of 10 ex-trainees stated that their traineeship experience was useful in finding a regular job. Several studies 2 confirmed the effectiveness of traineeships in enhancing trainees’ chances of securing a job. This is particularly true for traineeships within active labour market policy (ALMP) measures: participants in ALMP-type traineeships find regular employment more easily and in a shorter time span than non-participants. Increasingly, however, a range of stakeholders have voiced concerns about the quality of traineeships. Various studies and surveys 3 confirmed these concerns, particularly with regard to insufficient learning content and substandard working conditions. As a European response to these concerns, the Commission proposed a Council Recommendation on a Quality Framework for Traineeships (QFT), preceded by a two-stage social partner consultation that did not result in a social partner agreement. 4 The Council Recommendation was adopted by the Employment, Social Policy, Health and Consumer Affairs Council (EPSCO) in March 2014. 5 It makes recommendations on the quality of traineeships in terms of learning content, working conditions, and transparency regarding financial conditions and hiring practices. The Recommendation contains 22 quality elements that are directly transposable into national legislation or social partner agreements. The QFT is particularly relevant as a reference for quality offers of traineeships under the Youth Guarantee, since many national Youth Guarantee schemes foresee traineeships as one of the four types of offers 6 for young people. This Staff Working Document (SWD) analyses how Member States’ existing and new legislation and social partner agreements comply with the requirements of the QFT and points to remaining challenges. It does not, however, assess the extent to which legislation and agreements are respected. Compliance of national legislation with EU law covering traineeships is monitored on an ongoing basis. The SWD also builds on a strategic dialogue with civil society (including the European Youth Forum) on 29 January 2016 and on an exchange with social partners during the 17 February 2016 Social Dialogue Committee. In the forthcoming sections the SWD outlines the scope of the Council Recommendation (Section 2); presents the overall implementation measures for the QFT (Section 3); provides an assessment of compliance of each key quality criteria set by the QFT (Section 4); presents the use of European Structural and Investment Funds for traineeships (Section 5); presents Commission support to the implementation of the QFT (Section 6); and finally considers remaining challenges (Section 7). The QFT has a limited scope, as it only covers two main types of traineeships: those available on the open market, as well as those that are part of ALMP programmes. It does not cover traineeships that are part of the curricula of formal education or vocational education and training (VET), neither does it cover traineeships whose completion is mandatory in order to access a specific profession (e.g. teaching, medicine, architecture, etc.). The reason for this is that traineeships which belong to these categories are in general of better quality, due to the quality assurance by the educational institutions or professional organisations involved. In the case of open market traineeships there is no third party involved further to the trainee and the host organisation, which also means that the quality assurance of the traineeship becomes more difficult. ALMP-type traineeships, on the other hand, are offered to (young) unemployed or those at risk of becoming unemployed, and there is usually a public institution (most often a PES) acting as an intermediary between the host organisation and the trainee. This intermediary institution also has a supervising function in terms of traineeship quality. Table 1 below summarises the main differences between these two types of traineeships. Source: European Commission based on ICF analysis. All Member States have some form of regulation on ALMP-type traineeships. In comparison, open market traineeships are generally less regulated and only to varying extents across the EU. In some Member States 9 such traineeships — involving a direct agreement between employer and trainee — are not allowed by law. Moreover, in a number of other Member States, 10 traineeships in the open market — although legally possible — are reported to be very rare or nearly non-existent. In the majority of Member States open market traineeships are either not regulated, or are subject to general labour law provisions. Table 2 below presents an overview of the forms of regulation on both types of traineeships in the EU-28. Source: ICF analysis based on EEPO experts’ reports. MS with regulatory frameworks (overarching laws or specific legal acts) concerning both types of traineeships: BE, BG, DE, ES, LT, PL, PT, RO, SI. MS with a regulatory framework on one type of traineeship: DK, EE, HR, IT, MT, SK, FI, SE. MS with weak regulatory frameworks (only specific ALMP programmes or some general provisions in labour law): AT, CZ, IE, EL, FR, CY, LV, LU, HU, NL, UK. Eight Member States 11 have undertaken legal changes to strengthen the alignment of national frameworks with the Council Recommendation since its adoption in 2014, and six Member States reported that further legislation on traineeship quality is being planned. 12 Most of the reforms concern limiting the duration of traineeships to six months, clarifying conditions for longer traineeships and assigning mentors to provide guidance and supervise progress during the traineeship. Although not targeting traineeships specifically, some Member States 15 also adopted new reforms, such as amendments to labour laws or ALMP reforms, which had an influence on the traineeship systems. Table 3 below, gives an overview of recent legal changes adopted in the EU-28 in line with the QFT. In addition to the above, recent — although pre-QFT- traineeship legislation in Italy 16 and Romania 17 also complies to a large extent with the QFT (the Italian framework even served as a model for the Commission proposal at the time). Furthermore, while the UK officially does not intend to implement the QFT, there has been a Code of Best Practices elaborated in 2011 with the aim to ensure high quality internships. This Code is promoted among others by the UK government. Only a few Member States 18 reported having significantly involved social partners in drafting new legislation or having concluded social partner agreements on the topic of traineeships. In some other Member States social partners have been involved in monitoring the quality of traineeships, or the promotion of traineeships. 19 In the majority of EU countries, there has been only very limited or no cooperation with social partners in terms of making traineeships compatible with the QFT. It can thus be considered that point 21 (promotion of active involvement of social partners in applying the QFT) has been implemented only to a limited extent. In Luxembourg, the government is in negotiations with social partners to set up a new traineeship framework in line with the QFT. However, as of May 2016 it is not known whether the existing framework regarding traineeships will indeed be altered in the light of the QFT or not. In Slovenia, provision of paid traineeships is one of the goals set in the new Social Agreement for 2015-2016, signed by social partners in February 2015. However, it is not clear what specific changes this would imply and how they would match the QFT. The trade unions are more active in the area of traineeships than employers’ associations; for example, in 2012 one of the Slovenian trade union confederations proposed the introduction of compulsory traineeships for young people. In Spain, a new Agreement for Employment and Collective Bargaining for 2015-2017 (ANC 2015-2017) was signed in June 2015 by the social partners. According to the agreement, social partners will prioritise labour traineeships (with work contracts). Although there are no social partner agreements with a specific focus on traineeships in Denmark, local unions are involved in monitoring that traineeships and employment with a wage subsidy do not crowd out ordinary jobs. Bulgarian social partners reported about their contribution to the development of a new type of traineeship contract. At the level of the EU social partners a Framework of Actions on Youth Employment (non-binding guidelines) was negotiated in 2012-2013. The latest (second) follow-up report on the Framework of Actions (September 2015) includes national actions and best practices from 21 EU MS linked to the four priorities identified in the Framework of Actions: learning, transition, employment and entrepreneurship. Among these best practices some relate to the promotion of traineeship programmes (e.g. CY and PT), while in the case of BG social partners report about their contribution to the development of a new type of traineeship contract. Social partners in a number of sectors (Chemical Industry, Commerce, Construction, Education, Electricity, Personal Services, Postal Services, Road Transport, and Telecommunication) have also reached joint positions on skills incl. with specific actions on traineeships and pledges on apprenticeships to raise their availability and improve their quality. These are the quality criteria considered to be elementary in order to ensure that a traineeship is of sufficiently high quality in terms of learning content, working conditions and transparency. 20 In addition to the above criteria, this section also examines how national legislations comply with the QFT points related to cross-border traineeships. It is important to note that due to the differences in the level of legislation of open market and ALMP-type traineeships, while open market traineeships comply with individual QFT criteria only in a few Member States, ALMP-type traineeships are fully or mostly compliant with the individual QFT criteria in most Member States. 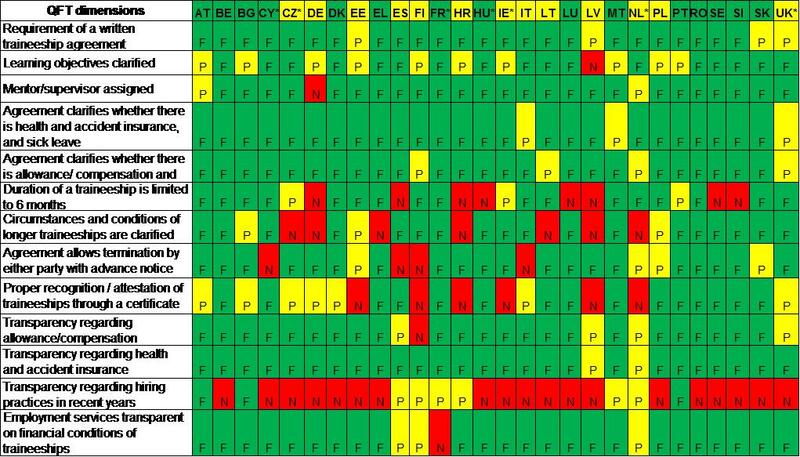 Table 4 below presents an overview of compliance of open market traineeships with the QFT dimensions in the 28 Member States of the EU. Table 5 presents the same for ALMP type traineeships. According to the points 2 and 3 of the QFT, traineeships should be based on a written agreement between the trainee and the traineeship provider. This agreement should indicate the ‘educational objectives, the working conditions, whether an allowance or compensation is provided, the duration of the traineeship, the rights and obligations of the trainee and of the traineeship provider, including where relevant, the traineeship provider’s policies on confidentiality and the ownership of intellectual property rights’. In all Member States there is some form of written agreement for ALMP-type traineeships. However, this is not always the case for traineeships in the open market. In seven Member States 21 a written agreement is not required by law when the traineeship is concluded between the employer and trainee. Even in Member States where a written traineeship agreement is a formal requirement, the agreement often does not cover all elements as required by the QFT. Most often information on the educational objectives and conditions regarding allowance/compensation are missing. The QFT indicates in its points 4 and 5 that learning objectives should be clarified in the written agreement between the trainee and the traineeship provider. It also invited Member States, in point 4, to ‘promote best practices as regards learning and training objectives in order to help trainees acquire practical experience and relevant skills; the tasks assigned to the trainee should enable these objectives to be attained’. Point 5 of the QFT invites Member States to encourage traineeship providers to designate a supervisor for trainees, thereby guiding the trainee through the assigned tasks, and monitoring and assessing his/her progress. This quality aspect presents the biggest discrepancy in compliance between ALMP-type and open market traineeships across the EU. In the case of the former, 25 Member States have in place legislation that requires a mentor or supervisor to be assigned to each trainee. This is only the case in seven countries 24 regarding traineeships in the open market. It is important to note in this context that Directive 91/533/EC 29 — commonly referred to as the Written Statement Directive — requires employers to inform their employees in writing about the essential aspects of their employment relationship, be it by way of an employment contract or a different kind of document issued by the employer. The information must be provided when the employment starts or up to two months thereafter. The Directive is currently subject to a REFIT evaluation by the Commission. The latter also looks at the possible coverage of trainees under this Directive. 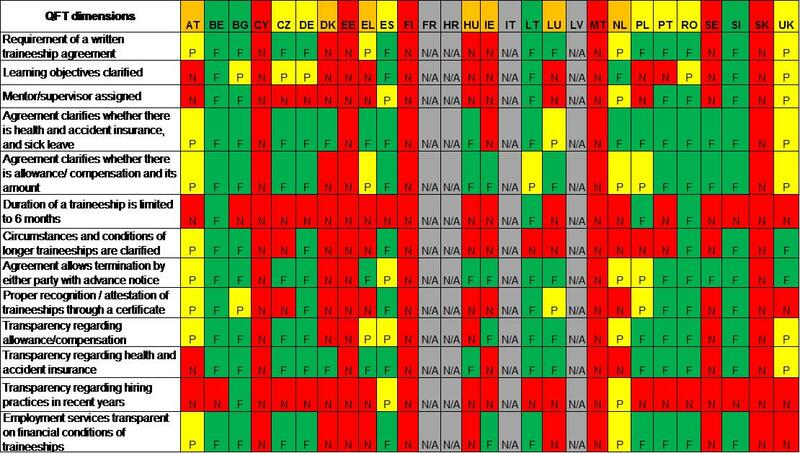 Preliminary results of the legal analysis at national level indicate that trainees are always covered by the rules transposing the Directive or specific legislation in 11 Member States. 30 In the rest of the Member States, trainees are covered if they fall within the definition of an employee, which in most cases includes a requirement that they are remunerated. In its point 10 the QFT indicates that Member States should ‘ensure a reasonable duration of traineeships that, in principle, does not exceed six months, except in cases where a longer duration is justified, taking into account national practices’. Again, Member States respect this principle more in the case of ALMP-type traineeships, where 17 Member States are in full compliance and further 4 Member States comply for most types of traineeships (with allowing for some traineeships targeted to certain disadvantaged groups to be longer). For open market traineeships, only four Member States 31 set the maximum legal duration of a traineeship to six months, while in the majority of Member States there is either no legal limitation of duration, or the maximum duration can be longer than 6 months. According to point 11 of the QFT, the circumstances and conditions under which a traineeship may be extended or renewed, after the initial traineeship agreement has expired, should be clarified. Such clarifications exist in 15 Member States for ALMP-type traineeships and in four more Member States at least for some ALMP measures on traineeships. Only six Member States comply with this rule for open market traineeships; however, the high share of non-compliance is partly due to the fact that in some countries traineeships cannot be extended. The QFT (point 12) invited Member States to ‘encourage the practice of specifying in the traineeship agreement that either the trainee or the traineeship provider may terminate it by written communication, providing advance notice of an appropriate duration in view of the length of traineeship and relevant national practice’. This rule is respected in 22 Member States in the case of ALMP-type traineeships (although in 5 of those while termination is allowed, it is not necessarily indicated in the traineeship agreement). Similarly, in 16 Member States also open market traineeships comply with this rule (with four Member States of the 16 not requiring this aspect to figure in the traineeship agreement). Only in a minority of Member States the conditions for terminating the traineeship are not set by law: in six Member States 32 in the case of open market traineeships and in five Member States 33 for ALMP-type traineeships. The QFT recommends that Member States should ‘promote the recognition and validation of the knowledge, skills and competences acquired during traineeships and encourage providers to attest them, on the basis of assessment, through a certificate’. As for ALMP-type traineeships, 20 MS comply at least partially (e.g. in some cases, the employer issues a letter of recommendation, that does not necessarily cover all aspects detailed in the QFT recommendation). Only seven MS comply with this rule in terms of open market traineeships — this quality aspect has one of the lowest levels of compliance of all the QFT criteria. Transparency requirements are seen as an innovative element of the QFT: while the QFT does not recommend that traineeships are paid under all circumstances, point 14 says that Member States should ‘encourage traineeship providers to include in their vacancy notices information on the terms and conditions of the traineeship, in particular on whether an allowance and/or compensations and health /accident insurance are applicable as well as information on recruitment policies, including the share of trainees recruited in recent years’. The objective was to allow trainee candidates the possibility to make a well informed decision about accepting or refusing a traineeship offer, based on information regarding financial conditions and hiring chances. Results are rather mixed when it comes to the take up of this point by Member States. While it seems to be well accepted for financial and social security conditions, 34 take-up is marginal in the case of transparency on hiring chances. This QFT aspect records by far the least compliance across the EU for both open market and ALMP-type traineeships. Only in a minority of Member States is information regarding hiring practices required to be included in vacancy notices: this is the case for eight Member States 35 for ALMP-type traineeships and only two 36 for open market traineeships. Points 16 and 17 refer to the facilitation of cross-border traineeships within the EU. According to point 16 Member States should i.a. clarify national legal frameworks for traineeships, establish clear rules on hosting and sending trainees, and reduce administrative formalities. Point 17 refers to the extension of EURES to (paid) traineeships. Following a Commission Implementing Decision on EURES in November 2012, 37 Member States endorsed in 2013 a two-step approach: 1) presentation of information on the EURES portal by country on apprenticeships and traineeships in general, in line with point 16 (country sheets); 2) development within the framework of EURES, of a form of clearance, in line with point 17 (exchange of offers and applications for traineeships and apprenticeships across borders). All Member States have provided country sheets in 2015 that will be translated and published by the Commission on the EURES portal by the end of 2016. In the meantime, the EURES Regulation has come into force and replaced the above Decision. 38 It introduces the obligation on Member States to share EU-wide data on those apprenticeships and traineeships subject to an employment relationship within two years after the date of its entry into effect (14 May 2018). A significant share of ESF funds is used to cover employers’ costs related to trainees, typically in the form of wage subsidies. 41 In certain cases (e.g. HR), ESF financing is used to put in place support systems for employers to provide mentoring of trainees. To this the Youth Employment Initiative (YEI) should be added, which provides 6.4 billion of targeted funding to young persons not in employment, education or training. Traineeships and apprenticeships represent a major share of the YEI-supported actions. Over 70 % of the 20 eligible Member States are implementing traineeships and apprenticeships measures. Some, such as BE, CY, ES, IT and PL financially prioritise the share of traineeships and apprenticeships in comparison to other measures supported by the YEI. Wage subsidies and measures to reduce non-wage labour costs are currently implemented with YEI support in over half of the Member States. The ESF and YEI together will therefore invest at least 12.7 billion EUR over 2014-2020 to support youth labour market integration measures. Examining together with Member States the possibility to include paid traineeships in EURES, and setting up a dedicated webpage on national legal frameworks for traineeships. Between the adoption of the Council Recommendation and the publication of this SWD on QFT implementation, the Commission was following up on all these areas. the organisation of awareness raising activities around traineeship (and apprenticeship) programmes in Member States. In April 2014 the Commission organised a workshop for the exchange of best practices regarding high quality traineeships. All three multilateral surveillance reviews of the Employment Committee on youth employment and the implementation of the Youth Guarantee (December 2013, 2014 and 2015) looked at traineeships as one of the Youth Guarantee offers. The QFT was also a recurrent topic on the agenda of the regular meetings of national Youth Guarantee coordinators in 2015 and 2016. In terms of cooperation with other stakeholders (in particular employers and youth/trainee organisations), the Commission jointly with CSR Europe launched the European Pact for Youth in November 2015 to create 10 000 quality business-education partnerships and to provide 100 000 new, good-quality apprenticeships, traineeships, or entry-level jobs. Your First EURES Job (YfEJ) and the platform ‘Drop’pin’ 45 have also provided targeted support for employment and training in a European context. Traineeship opportunities are also a part of the European Youth Portal, 46 which was restructured and re-launched in May 2013. The portal is evolving into a platform for young people to engage with policy-makers and to have their say on the issues that affect them. In addition, the Commission supported the Employers’ Guide to Quality Internships, 47 launched in March 2015 by the European Youth Forum, together with major businesses. Throughout 2014 and 2015 the Commission was also in regular contact with youth and trainee NGOs (in particular the European Youth Forum, B!NGO and InternsGoPro). Furthermore, as discussed in Section 4, the new EURES Regulation introduces the obligation on Member States to share EU-wide data on (paid) traineeships subject to an employment relationship as from 2018. The Commission will publish by the end of 2016 on the EURES portal the country sheets provided by Member States. In addition, the EU Erasmus+ programme is providing about 1 million opportunities to higher education and VET students, apprentices and recent graduates for traineeships abroad during the period 2014-2020. One in three students participating in this traineeship scheme is offered a job by their host company and one in ten create their own start-up. Finally, the QFT became a reference document for major EU initiatives such as the Youth Guarantee and EURES/YfEJ. The QFT sets the standards to determine what can be considered as a quality traineeship offer in these initiatives. This is of particular relevance at a time when the quality of offers is at the centre of the debate around the Youth Guarantee. Half of the Member States have undertaken legal changes that strengthened the alignment of national legal frameworks with the Council Recommendation since its adoption in 2014, or report plans to do so. The extent to which new legislation and social partner agreements are respected in practice needs to be seen. olack of rules on proper recognition of traineeships. In the majority of EU countries, cooperation with social partners in terms of making traineeships compatible with the QFT could be improved. Austria has not introduced any new legislation to implement the Quality Framework for Traineeships. There is no relevant legislation or social partner agreement in the pipeline either. Current legislation complies with QFT only to a limited extent. Traineeships can have two main forms of contracts in Austria, depending on whether they are training/educational relationships or employment relationships. The decision on the contractual form of the specific traineeship has to be made for each case separately. Jurisdiction mentions several criteria for an employment relationship, e.g. the embeddedness of trainees into the normal working process, fixed working time, a workplace etc. Most traineeships in Austria are employment relationships and are thus subject to general labour law, including the applying collective agreement and company agreements. One special form of employment related traineeships are those which underlie a freelance contract. This kind of traineeships is not or is just partially protected by the labour law. Only the legal requirements concerning the termination of employment have to be used within this form of traineeship. Educational related traineeships on the other hand are not regulated by law. In addition the Law against Wage and Social Dumping (‘Lohn- und Sozialdumping Bekämpfungsgesetz — LSDB’), in force since 2011, contains instruments to fight underpaid or unpaid employment related traineeships. In this context, intensified social insurance audits were carried out. As of December 2015, the level of the basic wage has to be specified in the position specification statement (Dienstzettel). This document is required if no work contract was concluded. All employment related contracts are subject to this regulation. This might enhance transparency concerning wage or compensation level. In general, for employment traineeships (which are the majority) while QFT recommendations regarding working conditions and transparency on financial conditions are well respected, there is no legislation to ensure a high quality learning content of traineeships. In Belgium the pre-existing traineeship legislation already complies to a large extent with the QFT (with the exception of transparency on hiring chances). Chapter X, ‘Conventions d’immersion professionnelle’, of the Title IV ‘Emploi’ of the Law Programme of 2 August 2002, forms a national framework to be respected by all traineeships. The federal legislation defines the most practical part of the traineeship agreement (objectives, working conditions, duration, rights and obligations, transparency). Nevertheless, the Convention d’immersion professionnelle has been transferred to the Regions after the 6th State Reform. There has been new legislation introduced since the adoption of the QFT on certain ALMP-type traineeships in the Brussels region and on dual training in Wallonia (although the latter does not fall under the scope of the QFT). These new pieces of legislation comply with QFT standards to a large extent, but cover only a small share of traineeships. In addition, the Brussels Government is preparing a draft regulatory framework on open market traineeships. Wallonia also has plans to update in 2016-17 legislation on the traineeship ‘entrepreneurial training’ (stage relative a la formation de chef d’entreprise). Finally, as reported by Flanders, the current state reform in Belgium may create additional opportunities to expand the number and the quality of the traineeships in accordance with the QFT. Brussels Capital Region: there is no formal obligation to recognise a traineeship through a certificate. Bulgaria has adapted its Labour Code (LC) in 2014 in order to comply with the Quality Framework for Traineeships. 48 The updated legislation complies to a large extent with the QFT. The new provisions introduced a traineeship employment contract (TEC) that did not exist beforehand. Such contracts shall be signed only with youth aged up to 29 years with secondary or higher education without being employed and without any professional experience on graduated profession or specialty. Employment relationships between an employer and a trainee shall be set in a contract signed in compliance with the general provisions for labour contracts regulated in the LC. TEC sets also the terms and conditions for remuneration of the trainees. The amount of the remuneration shall not be lower than the minimum wage in the country. Trainees are also entitled to all rights of people working under employment contracts, including occupational safety, trade union membership, collective bargaining, etc. TEC is a fixed-term contract for a period of no less than six months and no more than 12 months. The amendments to the LC provide for a definition of ‘traineeship’ — execution of certain work under mentorship, which aims acquisition of practical skills on acquired profession or specialty by a trainee. TECs (as all labour contracts) have to be registered with the National Revenue Agency (NRA) and National Insurance Institute. There are proposals for amendments to the Corporate Taxation Law to introduce tax alleviations for employers who sign traineeship contracts. However, as of June 2016 specific texts have not been proposed yet. Social partner agreements are not planned or proposed in this area. Traditionally, employers are declaring a willingness to participate in shaping any curricula, incl. for traineeships outside of VET, but in practice they are hardly joining the process. For ALMP-type traineeships the practice is to conclude a general type of fixed-term contract with unemployed (Art. 68 para. Item 1 of LC) for the duration of the traineeship. legislation does not cover traineeship in non-profit organisations. Croatia has not introduced any new legislation to implement the Quality Framework for Traineeships. There is no relevant legislation or social partner agreement in the pipeline either. Given that in Croatia open market traineeships virtually do not exist (other than traineeships mandatory for access to specific professions), this fiche summarises QFT compliance of the ALMP measure ‘Occupational training without commencing employment’ (a form of work-placed training). Traineeships within this programme only partly comply with the QFT. The Croatian government envisages the development of further training schemes and forms of work-based learning. Planned activities also include the development of shorter-term measures aimed at the development of on-the-job trainings to comply more with the needs of individuals who are particularly vulnerable, such as persons with disabilities and Roma, and to provide them with the opportunity to present their skills to potential employers. In addition, development of support to employers has been envisaged, primarily to enable them to build quality mentorships. Criteria for mentorships and quality work-based learning will be developed and necessary support will be ensured for mentors and educational organisations (financial, organisational, etc. ), capacities of employers for quality traineeships will be assessed, and the possibility of using an ‘outsourced’ mentor will be tested at the employers who do not have the possibility to organise their own mentors. Although significant development of the traineeship system in Croatia has been envisaged, the emphasis has been put primarily on the traineeships within the education system, while open market traineeships have not been considered in more comprehensive scope. There is no overarching legal framework for traineeships in Cyprus. Traineeships within ALMP programmes generally comply with QFT, while open market traineeships are not regulated at all — although they are not too frequent either. Recently an effort for regulating all kinds of traineeships offered in Cyprus has been initiated by competent authorities. It is not clear how far preliminary efforts in this direction have progressed. Given that for the last three years the political and economic priorities of the government were overwhelmed by the crisis and the need to implement Memorandum of Understanding provisions; it may not give the QFT top priority. The two programmes offered by the Human Resource Development Authority (HRDA) and aimed at providing job placement opportunities for the acquisition of work experience for young unemployed secondary graduates and young unemployed degree holders entail very clear job placement and training provisions and follow QFT recommendations 2-22 very closely. The Czech Republic has not introduced any new legislation to implement the Quality Framework for Traineeships. There is no relevant legislation in the pipeline, and no specific cooperation is foreseen with the social partners to make traineeships QFT compatible. Existing legislation only partly complies with the QFT. Companies frequently employ interns using the ‘agreement on work’, a general type of contract stipulated by the Labour Code. Although contracts for traineeships contain a job description, this is in general rather vague and hardly sets any learning objectives. There are no quality checks to monitor whether an intern is acquiring ‘practical experience and relevant skills’ as there is no supervisory body outside the employers. The ‘agreement on work’ does not require the intern to have a mentor. Duration can exceed 6 months. There is no certificate after the traineeship, in general a letter of recommendation is provided. Open market traineeships are QFT compatible to the extent that there is a written traineeship agreement, and that rights, obligations and working conditions are governed by the common rules of the labour law. ESF funded traineeship programmes (e.g. the ‘Traineeships in companies’ 49 under the OP Education and Competitiveness 2007-13) are much more aligned to the QFT stipulations. Trainees within these ALMP programmes are assisted by a trained mentor, and learning/training goals are set. Most ALMP-type traineeships take place in small and medium sized firms because administrative costs savings are more notable there, while larger employers prefer offering open market traineeships through the ‘agreements on work’. Denmark has not introduced new legislation in response to the Council Recommendation and no further legislation or social partner agreements are in the pipeline. Current legislation barely complies with QFT for open market traineeships; nevertheless, the level of compliance is relatively high for ALMP-type traineeships. Even these traineeships comply partly with QFT standards in terms of working conditions, as employers have an obligation to cover all employees, paid and unpaid, with an insurance towards work related accidents. The unpaid voluntary trainees will also be covered by the legislation concerning the working environment. Since 2003 unpaid traineeships with private or public employers have been an integral part of Danish active labour market policy. During the traineeship the trainee receives the normal benefit that he/she is eligible for (unemployment insurance benefit or cash benefits). A balance has to be kept between the number of ordinary employees and the number of trainees (maximum one trainee for five employees for workplaces with less than 50 employees and a maximum one for ten for workplaces with more than 50 employees). These short traineeships (max 3 months) comply well with QFT criteria, with the exception of a proper recognition through a certificate and transparency regarding hiring chances. lack of transparency of hiring chances in the case of ALMP-type traineeships. In Estonia there have been no legislative changes following the adoption of the QFT, apart from some developments in traineeships within the formal education system. There are no relevant social partner agreements, although social partners are in the PES governing board and are involved in the adoption process of employment programmes. Open market traineeships — which are most often offered to students, but are outside the formal education curricula and therefore not controlled by the educational institution — are not regulated in Estonia. The only relevant legislation entered into force on 1 July 2014: since then Estonian legislation requires any person working (or doing any activities, including as a trainee) in the premises of the employer to be registered at the Tax and Customs Board. This also includes the case where there is no salary/wage provided — in this case work has to be registered as volunteering. Conditions for ALMP measures are regulated by Labour Market Services and Benefits Act, which has not seen any changes since 2014. Some changes are planned in the new Unemployment Insurance and Labour Market Services Act, which is still waiting to be discussed in the Parliament. The regulations for ALMP type traineeships largely comply with the QFT recommendations, with the exception of the proper recognition of the traineeship and transparency regarding hiring chances. As for the former, a recent evaluation study already recommended to the PES to enhance the recognition of traineeships through a system of attestation. No proper recognition of ALMP-type traineeships. Finland has not introduced new legislation in response to the Council recommendation and no further legislation or social partner agreements are in the pipeline. In Finland almost all the traineeships belong to education curricula and are therefore outside the scope of the QFT recommendation. The very few open market traineeships are based on an employment relationship and the relevant provisions of the labour law and collective agreements are applicable. ALMP-type traineeships — in particular within the programme ‘Work experiment’ that provides the traineeship offers under the Finnish Youth Guarantee — comply to a reasonable extent with the QFT. lack of transparency — in particular regarding allowance/compensation (ALMP-type traineeships). In France, the legal framework formally forbids traineeships outside academic curricula, formal education or vocational courses. This was lastly confirmed by the Act of 10 July 2014 specifying the traineeship framework of educational traineeships. In this context, traineeships are very popular in most (near in each) of the curricula offered by the Ministry of Education and by the Ministry of Labour from secondary school to higher education, also in case of lifelong learning (but only in case of accessing a diploma or recognised certification). The POEC / POEI (preparation opérationnelle à l’emploi — operational preparation for employment): 400 hours of training, training plan elaborated by the enterprise. The individual approach (POEI) can be used only in case of a sustainable job at the end of the training course (access only for unemployed having a sustainable working contract). The collective approach, the POEC (also 400 h, but in which one third maximum work experience)does not need a contractual commitment from enterprises. ). The PMSMP: work experience of one month maximum duration, offered to unemployed for testing a career project. For POEC, AFPR and PMSMP measures, the duration of the traineeship period is no more than one month, and in the cases of POEI and AFPR, accessing these measures can be possible only if the unemployed has signed a working contract before being included in the measure. Germany has not introduced any specific legislation to implement the QFT, as previous legislation already complied to a large extent with the Recommendation. Nevertheless, the Minimum Wage Law coming into effect on January 2015 covers also traineeships that are longer than 3 months. The application of the Minimum Wage Law ensures an even higher level of compliance with the QFT (in particular regarding working conditions and transparency). *traineeships as part of ALMP to prepare for vocational training and provide some initial training to disadvantaged groups (Einstiegsqualifizierung § 54 a SGB III (Social code)), Berufsausbildungsvorbereitung §§ 68 to 70 BBiG (Vocational education law)). However, the above exemptions from the Law only affect the level of the remuneration of internships. Other rules regarding transparency and fixing details of employment relationships are not affected by the exemptions. In addition, new guidelines on traineeships in the public sector were issued on January 2015, limiting the length of voluntary traineeships to 3 months in federal institutions. Finally, new guidelines which came into effect in August 2015 have eased the access of refugees and asylum seekers to traineeships (§ 32 Abs. 2 Nr. 1 Beschäftigungsverordnung). the Minimum Wage Law does not require transparency on hiring practices. In Greece there has been no new legislation ensuring compliance of traineeships outside educational curricula with the QFT, apart from a new legislation regarding work experience relevant to ALMPs (L. 4368/16). Open market traineeships are not specifically regulated in Greece, but are subject to the general rules of the labour law. Thus, the trainees have to be provided with health insurance and they are entitled to the minimum wage. However anecdotal evidence indicates that many SMEs use traineeships as a form of cheap or free labour, which is illegal. ALMP type traineeships include very popular traineeship programmes for graduates of secondary and higher education.. The most popular traineeship programme run by the Ministry of Labour and the PES is the Voucher programme. It has been offering 5 months long paid traineeships to 42 000 18-29 year old trainees since September 2014. These ALMP-type traineeships, including the Voucher scheme are compatible to a large extent with the QFT. Under recent Law 4368/2016 (Article 83), PES (OAED) in cooperation with enterprises as well as with Social Cooperative Enterprises (Koin.S.Ep. ), implements work experience programmes for unemployed graduates of secondary and higher education. All the relevant terms and conditions (the conclusion of a tripartite written agreement between the PES, the enterprise and the beneficiary, a daily net allowance and health and accident insurance) will be defined by joint ministerial decisions of the Ministers of Labour and Economy. No specific legislation covering open market traineeships. No transparency regarding hiring practices in recent years. 4.A fourth, informal way of employing trainees is to employ them without any official contract. Hungary introduced its first ESF co-funded ALMP-type traineeship programme in 2012. The programme (SROP 2.3.4) supported 9 month long paid traineeships for young qualified career starters at micro, small or medium sized companies by fully or partially subsidising their wages and social contributions, as well as partially subsidising the wage of a mentor and the purchase of equipment needed for employing the trainee. 2300 trainees were involved in this programme in 2013-2014. A similar programme is running since August 2016 within the framework of the YG. No transparency on hiring practices. Ireland has not introduced any new legislation in response to the Council recommendation on a QFT and no further legislation or social partner agreements are in the pipeline either. Open market traineeships are not regulated, the only relevant legislation is the National Minimum Wage Act 2000: it sets out trainee rates of pay (between 75 and 90 % of the national minimum wage, depending on the time spent in the traineeship). As for ALMP-type traineeships, the most important programme is JobBridge. This is a national internship scheme operated by the Department of Social Protection. Traineeships within JobBridge last for 6 or 9 months. Trainees, who must be registered unemployed, receive an allowance of €52.50 per week on top of their existing social welfare entitlement. Nevertheless, in May 2016 it was announced that JobBridge would be discontinued after five years, with a new, more targeted scheme replacing it from September 2016. This is partly due to the fact that the scheme has been the subject of much debate, with some arguing that some employers may use the scheme to exploit unemployed young people. Overall, ALMP-type traineeships comply to a large extent with the QFT. lack of transparency on hiring practices (ALMP traineeships). National guidelines on traineeships were adopted in the framework of a State-Region agreement in January 2013 (Linee guida in materia di tirocini), which were then transposed into regional legislation by all regions within 6 months. These guidelines act as a common national regulatory framework setting the minimum quality standards for extracurricular traineeships, provided that the Regions and Autonomous Provinces may improve the framework defining more favourable conditions. The guidelines cover both ‘open market’ and ALMP-type traineeships. Further to the quality elements as promoted by the QFT, the Italian guidelines also make remuneration compulsory (min 300 EUR/months, however most regions decided to impose a higher minimum), and set the maximum of the trainee/permanent employee ratio at 10 % (for micro enterprises 1 up to 5 permanent employees, and 2 trainees for firms with 6-20 permanent employees). The Guidelines foresee that Regions are responsible of monitoring the traineeships, also using Compulsory Communication administrative data. ALMP-type traineeships can have a longer duration (up to 12 months — or even 24 months for specific disadvantaged groups). In general, while the Italian legislation can be considered as a model among EU Member States, the excessive fragmentation of the system within a scenario characterised by strong cross-regional imbalances could potentially lead to abuses. In the context of a fragile economic environment and high youth unemployment rates employers may be tempted to consider traineeships simply as a way to recruit cheap labour. Open market traineeships outside formal education are prohibited by law in Latvia (they are considered as undeclared work). ALMP-type traineeships, for example under the Youth Guarantee measure ‘First work experience’ and ‘Subsidised workplace’, as well as ‘First work experience in NGOs’ are governed by general labour law as there is a regular employment contract between the unemployed and the employer. This means that they comply with QFT only in terms of working conditions and transparency regarding financial conditions, as well as partly in terms of learning content. No rules on transparency regarding hiring practices (ALMP-type traineeships). Voluntary practice (VP — effective as of 1 January 2015). VP is open to any young persons (16-29) to perform an unpaid traineeship in a company or organisation by directly concluding a bilateral agreement. Trainees are covered by compulsory health insurance and social insurance against accidents at work and occupational diseases with state funds. Agreement on the acquisition of working skills (AAWS — effective as of 1 September 2014); AAWS is targeted to young unemployed (16-29), registered at PES. It offers a bilateral agreement between the host organisation and the trainee on the acquisition of working skills. During the traineeship young persons shall retain the status of an unemployed person and be covered with compulsory health insurance by the state. There is no additional income for the employer or young trainee. Both VP and AAWS comply with QFT to a large extent. The draft Law on Employment, currently discussed in LT Parliament, foresees to merge the two types of traineeship contracts. It is also foreseen to launch an additional ALMP-type traineeship that will be paid. Transparency requirements are not respected as for hiring practices (both types of traineeships). The QFT has not yet been implemented in Luxemburg; however there are tripartite negotiations ongoing with the participation of social partners to set up a new traineeship framework based on the Council Recommendation of 2014. In Luxemburg most traineeships are part of the educational curricula. In addition, there are traineeships offered to students between 15-27 years, but outside the curricula. This type of traineeship is regulated by Title V (Articles L.151-1 to L.151.9) of the Code of Work. The student signs a written contract (contrat d’étudiant) for a maximum duration of 2 months which includes i.a. the salary, the duration of the contract, as well as the tasks to be performed. While the student is not covered by a pension or health insurance, work accident insurance is guaranteed. These conditions are to a large extent in line with the QFT. The students also have the possibility to do a traineeship with a temporary contract (CDD) as a part-time employee. In this case the duration is restricted to 10 hours per week for a period of 4 weeks, while contracts can be signed for a period to up to 5 years. Students are covered by social security insurance and get a salary that does not exceed 80 % of the minimum social income. The biggest ALMP programme in Luxemburg that provides traineeships is ‘JobELO’. The contract offered within this programme (contrat d’appui emploi) complies to a large extent with the QFT (except for duration which can be up to 12 months). Duration of ALMP-type traineeships can exceed 6 months. Malta has not passed any new legislation to implement the QFT and there is no relevant legislation or social partner agreement in the pipeline either. In Malta open market traineeships are very rare, almost non-existent. Consequently, there is no relevant legislation on them. As for ALMP-type traineeships, the general framework is set by articles 29 to 45 of the Employment and Training Services Act (Chapter 343). Some aspects of ALMP-type traineeships are only partly compliant: learning objectives, health insurance, transparency on hiring practices. The Netherlands have not introduced any specific legislation to implement the QFT. There are no plans to do so in the future either, as the Government considers this falls under the responsibility of the social partners. While social partners are not negotiating towards any traineeship quality framework, FNV Jong (the Youth division of the trade union FNV) has launched a website to gather more data on the exploitation of trainees. Trainees can anonymously file complaints, which may help to increase awareness of this problem. Existing rules only partially comply with the QFT. Since in the Netherlands trainees are regarded as normal employees, working conditions including working time rules are generally respected. There is also a general health/accident insurance coverage to all trainees. Further than that, only recommendations exist regarding the conclusion of a traineeship agreement, learning content and transparency requirements. However there is no particular rule or recommendation for the duration and the recognition of traineeships, neither for transparency of hiring practices. Recommendations are promoted through websites and other channels of government-supported civil society organisations and social partners. The Act of 17 July 2009 on postgraduate internships (Journal of Laws No 127, item 1052) shows partial compliance with the QFT. Although a proposal was submitted in August 2015 to the Sejm (Parliament) by deputies of the (then) governing PO to amend the above Act so that it fully complies with the QFT, this legal proposal was put on hold after the elections in October 2015. Current legislation on open market traineeships foresees a written agreement that should include the tasks of the trainee, the duration, weekly working time, financial benefits (if any). The legislation does not require the definition of learning objectives, and there is no obligation to appoint a mentor/supervisor. While in terms of working conditions the QFT requirements are mostly respected, health insurance and remuneration are not compulsory; consequently, a large proportion of the traineeships are performed unpaid. Transparency on financial conditions is respected, but not on hiring chances. The duration of open market traineeships is limited to 3 months, but conditions for an extension are not defined. A written agreement is also required for ALMP-type traineeships. The agreement shall include the programme of the traineeship, but provisions on the learning content apply only to certain ALMP-type traineeships (those within the POWER programme, funded by ESF). ALMP-type traineeships also foresee a mentor/supervisor. QFT recommendations on working conditions and transparency are largely respected, except transparency on hiring chances. Duration of ALMP-type traineeships can be between 3 and 6 months. Lack of transparency on hiring chances. Although the proposal for amendment of the 2009 Act on postgraduate traineeships was offering a solution to these problems, it is unlikely that the proposed amendment will pass in the current term, taking into consideration a significant change in the distribution of forces in parliament and change in government policy. Portugal updated its legislation on ALMP-type traineeships in 2014 with a view to better comply with QFT. Portaria 56 149-B/2014 refers in particular to the ALMP programme ‘Employment Traineeships’ (Estágios Emprego) which involves on average 70 000 young trainees (18-30 year old) per year. Traineeships under this programme comply with QFT to a large extent, although they can be longer than 6 months (with a maximum of 9 months). The stipulations regarding traineeships under other (smaller) ALMP measures ‘Young Active Employment’ and ‘Reactivate’ (created by the Portaria 15/2014 and the Portaria 86/2015) are very similar to those regarding the ‘Employment Traineeships’ and also comply to a large extent with QFT (also in terms of duration as these are limited to 6 months). Open market traineeships are regulated by Decree-Law 66/2011. This regulation has not been reviewed since 2011. This Decree-Law was a result of a broader tripartite agreement on the reregulation of labour relations that had been signed in 2008. This agreement stipulated that unpaid traineeships should be forbidden. In general Portuguese legislation on traineeships meets to a large extent the requirements of the Council Recommendation on a QFT. Transparency requirements on hiring practices are not respected (open market traineeships). While Romania has not updated its traineeship legislation following the adoption of the QFT in 2014 and there are no initiatives in the pipeline either, since 2013 there is a comprehensive legislation on traineeships falling under the scope of the QFT (Law no.335/2013). Overall, current Romanian legislation complies to a large extent with QFT. The legislative framework covers both open market and ALMP-type traineeships, while not covering traineeships that are either part of the academic curricula or are regulated in by other pieces of special regulation. As for learning content, while the law provides for mentoring in the case of both types of traineeships, it is not sufficiently detailed on the definition of learning objectives. Working conditions of trainees are the same as for employees. The Law also ensures transparency, with the exception of hiring practices in recent years. The duration of the traineeships is fixed at 6 months. Lack of transparency on hiring practices (both types of traineeships). Slovakia has not introduced any new legislation to implement the QFT. There is no relevant legislation or social partner agreement in the pipeline either. No regulatory framework exists for traineeships in the open market. This is due to the fact that open market traineeships are rare in Slovakia. Young people prefer to engage in student jobs: according to the 2013 Eurobarometer on traineeships, 52 % of Slovak respondents had a student job experience against 8 % involved in a traineeship. For the latter the EU average was 46 %. Traineeships provided within ALMP schemes are regulated by the Act on employment services (No 5/2004 Coll.) The major ALMP programme to offer traineeships is called ‘Graduate practice’. It is offered to young people under 26 who have completed a relevant level of education in full-time study less than two years ago and have not had a regular paid job since then. Graduate practice takes place in a workplace during 3 to 6 months at maximum 20 hours per week. The labour office provides the trainee with a monthly allowance ( 65 % of the minimum subsistence level = EUR 128). - contribution to cover part of the necessary costs related to the mentoring and gaining of work experience. Overall, ALMP-type traineeships comply to a large extent with QFT. Lack of transparency regarding hiring practices (ALMP-type traineeships). Slovenia has not introduced any new legislation since 2014 to implement the QFT. There is no relevant legislation or social partner agreement in the pipeline either, except the recommendations given to ministries by the Government of Slovenia to abolish voluntary (unpaid) traineeships and accordingly change the legislations. On the basis of these recommendations relevant sectoral legislation is being changed and/or voluntary traineeship is no longer used in practice. The Employment Relationship Act (2013) provides a general framework for traineeships in Slovenia. Its provisions apply to both open market and ALMP measures. On the basis of these general guidelines each sector defines more precise provisions for traineeships within the branch’s Acts or collective agreements. These are in general compliant with the QFT. Lack of transparency of hiring practices. While Spain has not updated its traineeship legislation following the adoption of the QFT 57 in 2014, it has recent legislation on traineeships falling under the scope of the QFT. Overall, current Spanish legislation complies to a large extent with QFT. Art 13 of the Law 11/2013 regulates the traineeship work contract (Contrato de trabajo en prácticas). Such labour traineeship contracts (prácticas laborales) can be offered to graduates under 30 with a diploma (university, vocational education and training). For this two year traineeship remuneration must be proportional to an equivalent post, reaching at least 60 % of the average salary during the first year and 75 % during the second year. It cannot be below the minimum wage (655.20 per month, 14 payments per year). Trainees also benefit from full Social Security coverage. The norm also sets up hiring incentives for companies or self-employed when hiring young workers under 30 years old with a traineeship contract. The incentives consist of 50 % of Social Security rebates, up to 75 % if the worker was already performing a non-labour traineeship in the same company. Royal Decrees 1543/2011 and 1493/2011introduced non-labour traineeships (prácticas no laborales). These do not involve a labour relationship between the trainee and the host organisation, and are limited to graduates aged 18-25 without any working experience. The duration must be between 3 and 9 months. These traineeships must offer a remuneration of at least of 80 % of IPREM (Public Income Indicator of Multiple Effects, 532.51 euro per month in 2016, 80 % equals to 426 euro) and include Social Security coverage. These traineeships can be offered through the PES, through the open market, in the website of companies or in job portals, through specific programmes by foundations or even through the employment offices of universities. Social partners are also committed to design and implement youth policies and to promote synergies with their own initiatives. The new Agreement for Employment and Collective Bargaining for 2015-2017 (ANC 2015-2017), signed the 8th of June of 2015 by the main representative trade unions (CCOO and UGT) and employers’ organisations (CEOE, CEPYME), states that social partners will prioritise labour traineeships rather than non-labour ones. The Agreement also highlights the importance of curricular traineeships, such as Dual Vocational Training, and that traineeships serve as an entry to stable employment, becoming regular jobs in the companies that provide them. This strategy, although approved in 2013, briefly shows the pipeline of expected measures to be taken by the government related to youth employment in the 2013-2016 period. However, this strategy finishes this year. Insufficient transparency regarding allowance and hiring practices in recent years. Sweden has not introduced any new legislation in response to the Council recommendation and no further legislation or social partner agreements are in the pipeline. While there is no specific legislation regarding open market traineeships, trainees are in general considered as employees and are protected in accordance with Swedish labour law, health and safety at work legislation and collective agreements applicable at the workplace. As for ALMP-type traineeships, it is the Regulation on Labour Market Programmes (Förordning om arbetsmarknadspolitiska program, SFS 2000:634) that provides a legal framework. Other relevant legislation in the area is the Regulation on the Labour Market Policy Operations (Förordning om den arbetsmarknadspolitiska verksamheten, SFS 2000:628), Regulation on Activity Support (Förordning om aktivitetsstöd, SFS 1996:1100) and Act on Labour Market Programmes (Lag om arbetsmarknadspolitiska program, SFS 2000:625). The programme ‘Vocational Introduction Employment’ was launched in 2014. It is targeted at young job seekers (15-24 years) registered at PES and unemployed for at least 3 months over a 4 month period. The trainee receives a wage of at least 75 per cent of the current collectively agreed wage and is covered by social insurance. The duration is at least 6 months. The employer must be able to offer the young person supervision and training in at least 15 % of the time. The employer receives for up to 12 months a compensation corresponding to the payroll tax (31.42 per cent of the labour cost) as well as a compensation for supervision amounting to SEK 115 (around €13 per day). Since June 2016 the Vocational Introduction Employment is also open for people over 25 years of age who have been unemployed for 12 months, as well as some for the new arrivals registered at PES. A new traineeships programme since November 2015 is targeted at young people (20-25 years old) registered at PES and unemployed for at least six months (three months since June 2016). These traineeships can take place either in the welfare sector (health care, elderly care, etc.) or in occupations with shortage of employees. The participant receives a wage and other employment benefits according to the sector’s collective agreement. The duration is 3 to 12 months. The employer receives a wage subsidy covering 85 per cent of labour costs in the welfare sector plus a grant of SEK 100 per day for supervision/mentorships. The compensation is 50 % of wage cost for trainee jobs in the second case (occupations with shortage of employees). Since June 2016 the traineeships programme is open for people over 25 who have been unemployed for 12 months, as well as for new arrivals registered at PES who are 20 years or older. Overall, ALMP-type traineeships comply to a large extent with the QFT. lack of transparency on hiring practices (ALMP-type traineeships). The UK opted not to implement the QFT. Nevertheless, the UK remains committed to raising the quality of ‘internships’, in particular through a voluntary approach that involves codes of good practice. The most prominent of such voluntary codes is the Common Best Practice Code for High Quality Internships. 58 It was published in 2015 by the Department for Business, Innovation and Skills (BIS), but is the product of the Gateways to the Professions Collaboration Forum. 59 The code of good practice addresses most of the areas covered by the QFT but does not comply in terms of the duration of internship, as well as transparency regarding hiring practices. ‘Traineeships’ were introduced from August 2013 and aim to support 16-24 year old unemployed in preparing them for a job or apprenticeship. The young person is referred to a Traineeship by jobcentres but is not obliged to accept it. The maximum time for participation on a Traineeship is six months with a minimum requirement of six weeks. Those on a traineeship are not required to be paid (they fall under an exemption in the National Minimum Wage) though employers can voluntarily do so. The ALMP-type traineeships broadly comply with the provisions in the QFT with the exception of the recognition through certification — in the UK it is not a requirement. There is a lack of transparency regarding hiring practices, while many traineeships are unpaid. Eurobarometer 378: http://ec.europa.eu/public_opinion/flash/fl_378_en.pdf ; according to the survey 46 % of the respondents had at least one traineeship experience. I.a. Apprenticeship and Traineeship schemes in EU 27: Key success factors. A guidebook for policy planners and practitioners. European Commission / Ecorys 2013. I.a. Interns Revealed, European Youth Forum, 2011; Eurobarometer on traineeships, 2013. While European Social Partners could not agree on launching negotiations on a possible QFT agreement under Article 154 TFEU, they included traineeships in their 2013 Framework of Actions on Youth Employment. Council Recommendation on a Quality Framework for Traineeships (2014/C 88/01); OJ C 88, 27.3.2014, p. 1-4. The four types of offer are: employment, continuous education, an apprenticeship or a traineeship. None of these reports was published. BE, LT and SI adopted an overarching regulatory framework on traineeships, which applies to both open market and ALMP-type traineeships. BG, DE, ES, PL and PT have specific legal regulations on both types of traineeships, though they are separate. BG, DE, EL, ES, FR, LT, PT, SE. EE, ES, LV, LT, PL, SI. Although no legislation is in the pipeline yet, BE, HR and CY have intentions or broad plans towards further regulating traineeships in line with the QFT. E.g. CY, FI, HR, HU, MT. BE, BG, DK, DE, HR, IT, HU, MT, NL, AT, PL, SE. E.g. in CY and PT. This section focuses on the assessment of these criteria. Points 9 (rights and obligations) and 22 (involvement of PES, educational institutions and training providers) are not assessed in this SWD, as they are not of direct relevance to the quality of traineeships. A brief analysis of the use of European Structural and Investment Funds (point 18) can be found in Section 5. Point 19 (applying the QFT as soon as possible) is assessed throughout the present SWD. Point 20 (provide information to the Commission) is assessed in Section 6 of the SWD. Point 21 (social partner involvement) was assessed in Section 3. DK, EE, IE, HU, FI, SK, FI, SE. BE, BG, CZ, DE, ES, LT, NL, RO, SI, UK. BE, BG, LT, NL, PT, SI, UK. N.B. the European Commission did not take a stance on whether traineeships should be paid or not, as this does not fall within EU competence. Nevertheless, recommendations 14 and 15 on transparency regarding compensation and social security coverage, as well as hiring chances aim to equip trainee candidates with the necessary information to be able to make well informed choices already at the time of the application. In the case of open market traineeships only DK, EE, FI, IE, SE and SK do not comply. As for ALMP-type traineeships, all Member States comply at least partly, with the exception of LT. However, the actual enforcement of general labour law provisions as regards trainees was not specifically assessed. This is the case for ALMP-type traineeships in DK, EE, ES, FR, IE, LT, PT, SE, UK. Council Directive of 14 October 1991, OJEC, n° L 288/32 of 18.10.91. BE, BG, CY, DE, ES, FR, HU, PL, PT, RO, SI. BE, LT, PL, RO. However, it is important to remember that in 6 Member States open market traineeships are either not allowed by law or very rare (see in Section 3). DK, EE, EL, SK, FI, SE. CY, EL, ES, IT, FI. In the case of ALMP-type traineeships all MS comply at least partially, while for open market traineeships all but DK, EE, FI, IE, SE and SK. BG, DK, EL, AT, PT, RO, SI, SE. BG and SI. Another two MS (ES and NL) require some information on recruitment policies, but not necessarily data about the share of trainees recruited in recent years. OJ L107, 22 April 2016, nr 59; http://ec.europa.eu/social/main.jsp?catId=1083&langId=en. Such as hard-to-place unemployed people, young people unable to find a job in line with their qualification, NEETs, young people at risk of social exclusion and young people from marginalised communities, etc. BG, CZ, EL, ES, HR, HU, PL, PT, RO. This is the case in BG, ES, HU, RO. For more information on the results of the project visit: http://ec.europa.eu/social/main.jsp?catId=1045&langId=en. BG, CY, EL, ES, IT, LT, LV, MT, PL, RO. For more details visit: http://ec.europa.eu/social/main.jsp?langId=en&catId=1045&furtherEvents=yes&limit=no . See LC articles 233а, 233b and 233c. Evaluation of the project: http://www.narodnikatalogstazi.cz/images/NKS/SvF_evaluacni_zprava.pdf. Se for instance http://www.information.dk/276394 . Compulsory traineeships are regulated by the Government Decree 230/2012. (VIII. 28.). Act IV of 1991 on Job Assistance and Unemployment Benefits https://ec.europa.eu/migrant-integration/librarydoc/act-iv-of-1991-on-job-assistance-and-unemployment-benefits . Act I of 2012 on the Labor Code. Act V of 2013 on the Civil Code. NB the Italian traineeship guidelines also served as a model for the Commission’s original proposal for a Council Recommendation on a Quality Framework for Traineeships. A ‘Portaria’ is a ministerial order. NB there has been new legislation for traineeships outside the scope of the QFT (see Royal Decree 592/2014). The Gateways to the Professions Collaborative Forum is an ad hoc advisory body. Its membership is voluntary and represents around 60 professional bodies and related organisations. It was re-launched in January 2010 in response to recommendations of the Panel on Fair Access to the Professions.